2. Why do prices go up at renewal? 4. Why doesn’t everyone do renewals like this? 5. Will it always be like this? We designed our pet insurance based on more than 40,000 comments from pet owners. Their input was vital and we acted on it to improve the quality of pet insurance. We renewed our first policies in February 2018, just as we did when we created our products, we asked our members to tell us what frustrated them about their renewal experiences with other insurers and we received a great response - a big thank you to our members for their help! We know it’s common for insurers to make big price hikes (especially for those that have needed to claim) but it was valuable for us to understand how many customers are fed up with these tactics. Why do prices go up at renewal? It would be wrong for us to say prices shouldn’t increase but we believe this can be done better. Unless you have Bought By Many’s Fixed for Life policy, most customers will find their price goes up at renewal because of things outside of their control that need to be factored into the cost of insurance. Pet insurance acts as a private healthcare plan for your furry friend and as they get older there is a greater chance they will develop a health issue that needs vet treatment. Cats and dogs age much faster than humans so a single year can make a big difference to their health. The cost of treatment tends to cost more each year due to advancements in veterinary medicine. Vets can do more for pets than ever before but it comes at a cost. The Association of British Insurers say the average veterinary fee claim was £750 in 2016, up from £300 in June 2013. Insurers continually review the claims customers make and look for patterns in the data to predict future claims. This means that we might increase prices for some customers but decrease prices for others to reflect up-to-date predictions for someone’s individual circumstances. For example, we might reduce prices for specific postcodes if the cost of vet treatment in that area goes down. This prediction is crucial to making insurance pricing fair for everyone. Insurance is founded on the principle that the small contributions of the many, pay for the big unforeseen cost of the few and this prediction ensures the right contributions. We want to only make increases where we have to and to make them in a much fairer way than others. Based on feedback from our members, we’ve developed 3 principles to improve the renewals experience. We understand how frustrating it is to get your renewal price just to find the same product cheaper if you get a quote as a new customer. That’s why our existing customers won't pay any more than new customers. It can be very difficult to find cover for pre-existing conditions so if you’ve made a claim you could feel trapped with your current insurer. While previous claims can suggest your pet is more likely to need treatment again, sometimes your pet can just be unlucky! That’s why we will not be charging customers extra at renewal simply because they made a claim. We’re here to support you when your pet is ill and we don’t want customers to be worried about the financial repercussions on their insurance. 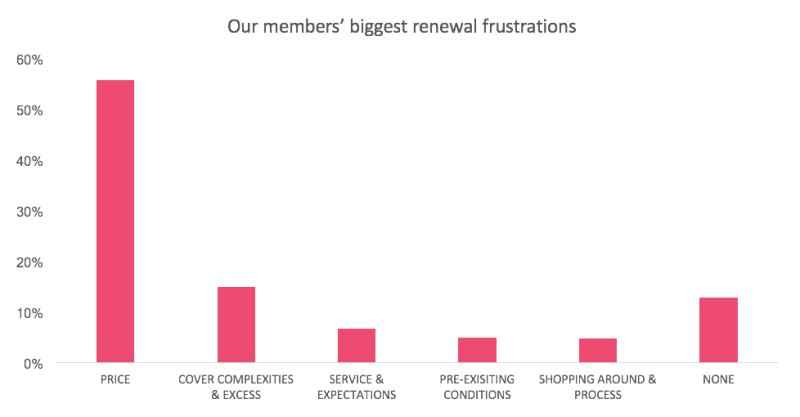 It was clear from our member feedback that price increases with no explanation are frustrating. Some increases are inevitable but we will be transparent to help you understand them. We also recognise that some customers may find cheaper insurance elsewhere - our aim is not to always be the cheapest insurer as we believe the overall package from Bought By Many offers greater value to customers. Why doesn’t everyone do renewals like this? These principles challenge the normal approach to pet insurance and they're difficult for some insurers to adapt to. As a new insurer, we’ve decided to start as we mean to go on. We’re passionate about our mission to deliver better insurance, for everyone and we believe this is the best way to support that. We’re confident this approach will improve insurance for our customers. Our innovative approach to renewal pricing will be live for our first renewals in February and we’ll be monitoring how it’s received carefully. In the spirit of transparency, this approach is unique so we may need to learn from our experience and refine it over time. We want to improve insurance for as many people as possible so we need to build a sustainable business. If we do need to make changes, we’ll share the basis for our decision and seek feedback from our members. We want Bought By Many’s renewal experience to lead the way in being fairer to customers so please get in touch us to let us know what you think.